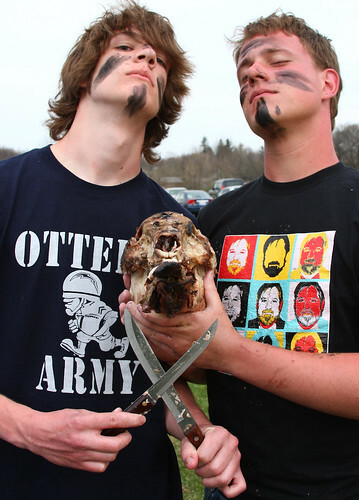 Above are Trevor and Stephen, the mighty pig carvers of the Mu Alpha pig roast I attended Saturday, complete with the pig head and war paint, err, war charcoal. Click the photo to view it large. I have been working on two papers, studying for an exam, and beginning to study for finals, so I apologize for the lack of content posted lately. Until finals are over, I will most likely only post photos, but they should be interesting.